Triad was a part of the ED Games Expo again this year! On December 9, 2015, the ED Games Expo showcased 30 small business firms and 60 games for learning developed with the support of SBIR. At the Expo, attendees played serious learning games while meeting the developers. It was the 3rd year in a row for the Expo (see a recap of the 2013 Expo here to read this link content and the 2014 Expo here) and 2nd year in a row for Triad. The event was open to the public and free to attend. Triad recently attended ESA’S ED GAMES EXPO in Washington, DC. 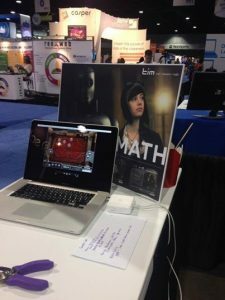 Read an overview of the event at http://wordsandnumbers.com/esas-ed-games-expo-features-inventive-stem-offerings/. TIM participated as a trade show vender at the ISTE 2014 Conference in Atlanta recently. See a screen shot from our booth below.